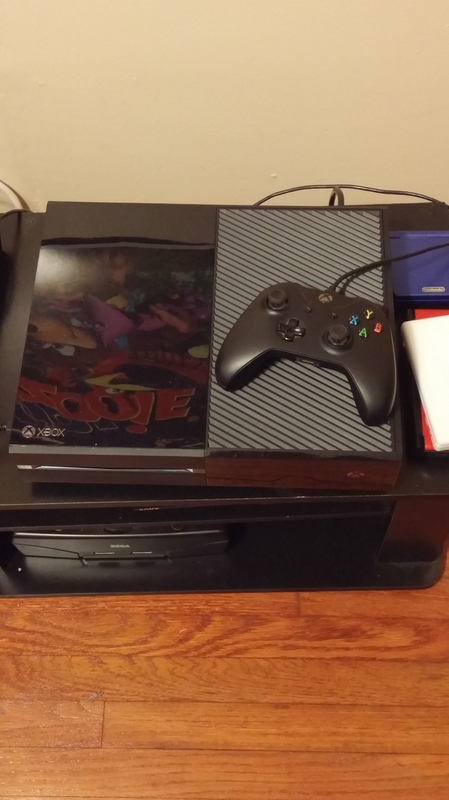 Thanks to the generosity of my cousin, I am now the owner of an Xbox One! But I’m not writing this to brag about adding another console to my collection, but because this now means I’ll be reviewing some Xbox One games! Now, admittedly, there aren’t as many games on the Xbox One that I’m as interested in as the Playstation 4 or Nintendo Switch (or the Wii U…may it rest in peace). But there are definitely a few games I’ve really been wanting to review for the system, as well as some on the horizon (Cuphead, for example). My cousin also gave me his copy of The Master Chief Collection, and I picked up a copy of Rare Replay. So now I can review (most of) the Halo games without having to re-buy the previous Xbox consoles, and a good slew of old Rare games (some of which I admittedly already own in their original forms, but many others I don’t). Granted, I still need to get some original Xbox One games to review, but what I have for the system already gives me a large amount of upcoming reviews on their own. Again, as far as gaming goes, I think the PS4 and Switch (and the SNES, always the SNES) will remain my main focuses here at the Dojo. But it’s great to finally be able to catch up on what the Xbox One has to offer. Nice one! Rare Replay is a great package to have (I’m not ashamed to admit I picked it up the moment it was released) with a ton of classics and various videos from the developers who worked on each one. I loved Rare back in the day. It seems like the only downside to Rare Replay is that, for obvious reasons, they couldn’t included any of the Donkey Kong games (DKC2 is still their greatest work, as far as I’m concerned). It’s great to have all the Banjo-Kazooie games in one place (I’ve even wanted to review Nuts & Bolts for a while, but sold my 360 some time ago, and had no idea what happened to my old copy of the game well before that). I am a little bummed that my copy was used, and therefore doesn’t have its proper box. Maybe someone online is selling just the box, then I can own the game proper. I don’t have an Xbox One but the master chief collection has made me think hard about it. I also want to give a shout out to the Gameboy SP chilling next to the one. My favorite gameboy iteration. GBA is still probably my favorite handheld, and the SP is the best console redesign in history, no question. Like I’ve said on Twitter, play Ori and the Blind Forest! I think you’d enjoy that metroidvania! Also Insomniac’s Sunset Overdrive is an excellent exclusive and one of their very bests. In terms of exclusives, it’s slim pickings – Scalebound would’ve been awesome if Microsoft hadn’t pulled the plug on that one. Here’s to hoping Sea of Thieves is awesome! Let’s start our own pirate crew! I’ll be sure to play Ori. Metroidvania is one of my favorite genres, and it’s always great to find a new work that can pull it off. Sunset Overdrive is also one I had my eye on. I always found it a bit funny how people were always so quick to wag their finger at Nintendo for not having enough third-party, multiplatform titles on their consoles, but seemed to gleefully ignore how Microsoft’s consoles have greatly lacked exclusives since the beginning. Aside from Halo and Gears of War, there wasn’t a whole lot of exclusivity to speak of. And between the two issues, I actually find that more glaring than a lack of multiplatform titles, since the exclusives are what give a console its identity. This is especially troubling today, when most of the multiplatform games are most acclaimed/played on either PS4 or PC anyway. Hopefully Sea of Thieves will begin a wave of Xbox exclusives to come. We should definitely make our own pirate crew. But we must talk like pirates as well.